Behold, ultimate American craftsmanship for your trigger finger. 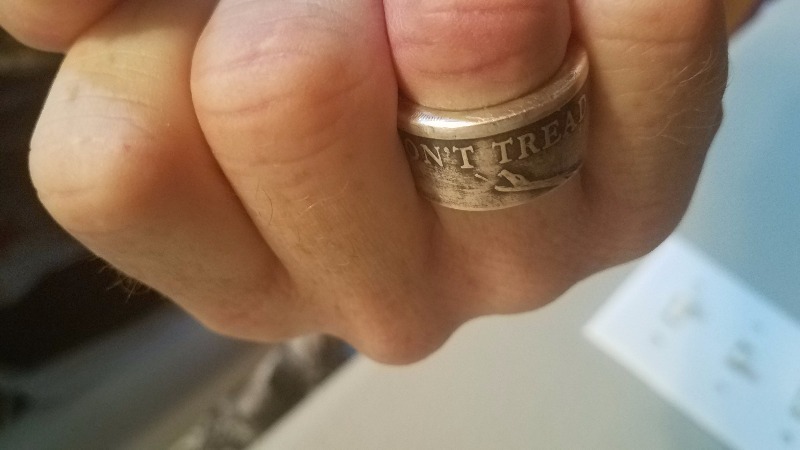 These handcrafted silver rings feature the famous line: Don't Tread On Me. Rings are coated with a protective finish to preserve the details of the ring. Since these are silver rings they do not leave a mark on your finger the way copper-nickel rings tend to. This is almost pure silver and looks incredible in person. - Use a clean, cotton cloth and mild dish detergent diluted in water for cleaning. Apply the diluted detergent to the cloth and rub the ring in one direction. Very nice ring. Not into rings but I do wear this one. My husband loves this ring! It’s a sturdy piece. The nice thing is that most people will not know what the ring says unless they stare at it. It is more like a personal reminder of the history and strength of the US. My overall experience with the item was great! I was very impressed with the quality of the ring - it was much higher quality than I expected. The only feedback I have is the size runs a bit small. I ordered this ring as finance's wedding band and it's too small. He typically wear's an 11.5 on his ring finger but it's too snug. We'll will probably have to place another order for a larger size. Other than the size we loved the ring. Tell an anti-gunner to kiss your *** with a handshake! Great customer service from 1776 United! Love the ring, a great way to express your appreciation for the 2nd Amendment. The ring is not.meant to be worn everyday being that its made from silver but the craftamanship is beautiful and i cant say enough good words about their customer service. Keep it up 1776!